At this moment in time I’m happily married to the man of my dreams—Valentine’s Day can’t scare me one bit & I plan to greet it with this homemade buttermilk dutch baby spiked with bits of my favorite Lindt LINDOR White Chocolate & Strawberries and Cream truffles, but this time last year I was as far from the comfort & safety I know now as possible: I was falling in love. Not any sort of love and the operative word is falling. A really brutal falling that had me dialing up a psychoanalyst and reading vintage French erotica (see last year’s post as evidence). My heart rate, as recorded by the monitor I’d taken to wearing on my wrist at the time, would spike into the red whenever I was within a city block of my now husband, and I vacillated between choking on bitter tears (no texts for two days), suffocating anxiety (finally a text! ), and a weightless elation (he wants to get Indian food!) that the best (or worst) of drugs could never match. My interior world became nothing save unparalleled highs and devastating lows, often multiple cycles within a 24 hour period. My mother and best friends listened to my mad sobs more than once on the phone as I compared him to heroin or swore I’d never speak to him again or that I’d die without him ad nauseam. I’ve never been more vulnerable. I thought it might kill me; it surely could have. Valentine’s Day , of course, was a particularly harrowing episode. He offered to make me dinner on Valentine’s Day, about ten days after we met. Bear in mind I was madly in love from day one. The obsessive waking-sleeping-dreaming thinking of them always kind. But hey, no big deal; we’re all adults here. As a once divorced grown woman in her 30’s and a life long detractor (passively, anyhow) of the holiday of canned romantic gestures, I think I believed myself when I said it was neither here nor there. Just any dinner on any night. He was supposed to come when he got off of work. One hour turned into two, two into three. No text, no call. No man I was in love with cooking me dinner. It was nearing midnight, and I laid awake reading on my bed (the aforementioned French erotica no doubt), shoving down that sick feeling, that awful voice that kept saying He stood you up…on Valentine’s Day! And despite my distaste, that last little fact made it so much worse. And around then is when he, cheerful & chipper (and oblivious) as ever, walked in the door. Being so in love, I couldn’t bring myself to show a flicker of fear, anger, or dismay. He scooped me up in his arms and kissed me, and at that moment the project of the universe, from my minuscule vantage point, was complete. The cold fear washed away, and he proceeded to cook me dinner at midnight. That wasn’t the end of the panics and pangs I went through before we were finally one another’s, the next day alone brought it’s own set of problems. But in that moment, for that night, I was his and he was mine. I was home. I get to be home everyday now. Though I still spend a lot of time on the road living out of a suitcase, the knowledge that he’s here when I return colors my world. We cherish every moment together, whether we’re running errands or cooking breakfast together. The latter being one of our favorite past times. He loves morning and thus loves breakfast. I hate morning and thus love breakfast (morning’s one redeeming quality). It’s perfect. 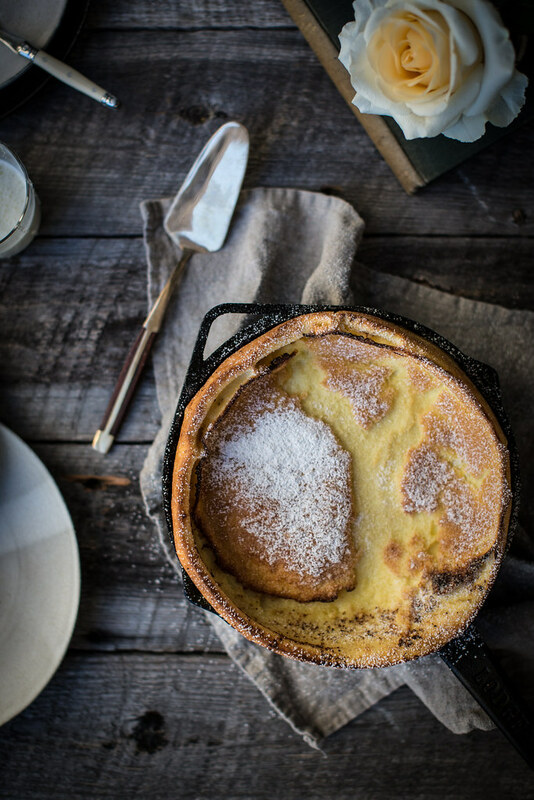 This fluffy, custardy dutch baby, a cup of his perfect coffee, and a few extra truffles on the side (I’m obsessed with their melty center…it has this cooling sensation that reminds me of coconut oil), this will be a much calmer Valentine’s Day. And I think I’ll give in and enjoy this one. But I won’t be expecting flowers, for him to just show up is still enough. More than enough. It’s everything. A few notes on making this Dutch baby all that it should be: whip the eggs until frothy (I use his man arm for this, but you could use your own strong arm or a blender as many people do). Then whip the buttermilk into the eggs until once again frothy and light. Foamy even. Then whisk the flour and salt in. Make sure your pan is really hot. I let mine heat up with the oven and then pull it out, let the butter melt in the hot pan with a few swirls, and then immediately pour my batter & dot with truffle bits in and stick it back in. Dust liberally with powdered sugar. Eat warm and fresh out of the oven, these babies don’t like to linger. Speaking of babies…more on that in my next post. Heat the oven to 425°F. Place an 8" cast iron or other oven safe skillet in the oven to heat along with it. In a mixing bowl whip the eggs with a whisk until frothy and pale. Really go for it. Add in the buttermilk and repeat this process. Add in the flour and whisk enthusiastically once again until smooth, light, and completely combined. Make this last whisk a bit shorter as we don't want to agitate the flour too much. Carefully remove the hot pan from the oven and melt the butter in it. Pour the batter into the pan and scatter the bits of truffle on top. Immediately place in the oven and allow to bake undisturbed for 20 minutes. Remove from oven when puffed and golden. Revel in it's initial glory (it will deflate as it cools), dust in powdered sugar, top with strawberries & cream, and enjoy with milk or coffee or milky coffee or tea as you please. Happy Valentine's Day! 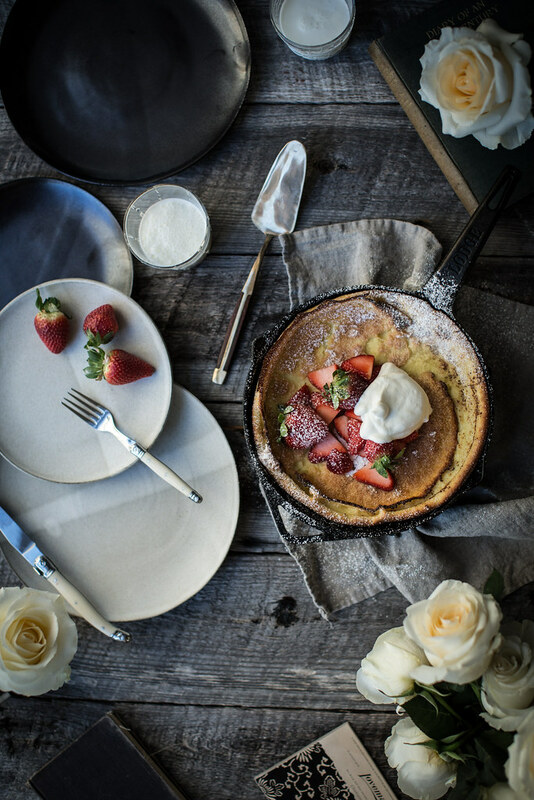 A big thanks to Lindt for their continued support of this site & for sponsoring our Valentine’s Day dutch baby recipe! 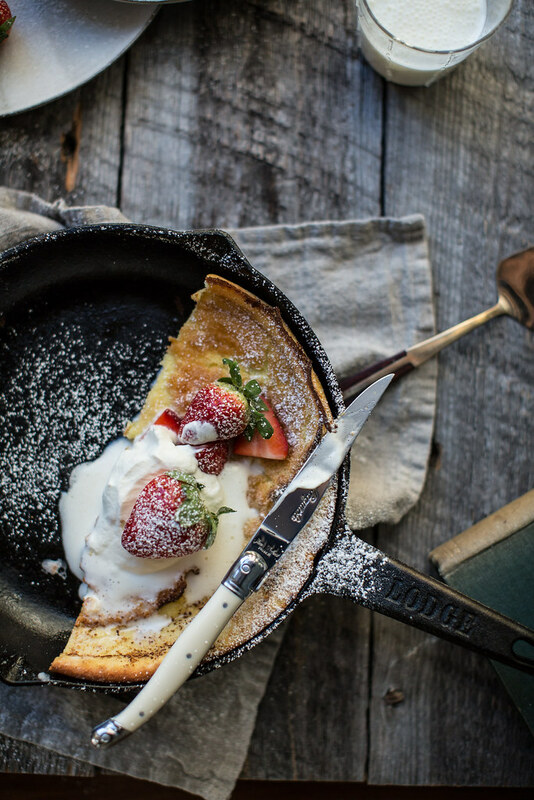 The white chocolate in this pancake sounds amazing! So yummy! Agreed! These here are “winter berries” grown in a solar tunnel. While an indulgence, they seem fitting at least once a year! Beth! This is so beautifully written & photographed. Congratulations on your new journey to motherhood. You two are going to make incredible parents! To give a new life a floor that is as high as your creative ceiling is such an incredible gift. I’m sure you two love birds will raise mighty world changers! Thanks for candidly sharing some of the most vulnerable and scary moments of your life with us. Your heartfelt words are what sets you apart from most other food blogs I come across. I hope you and your husband have a relaxing Valentines day and I hope Baby Milk relishes at the sound of your voices throughout. Congrats to a blessed couple! they’re delicious – we couldn’t wait to try them. pretty easy to make too considering what a treat they are. Such a sweet story! 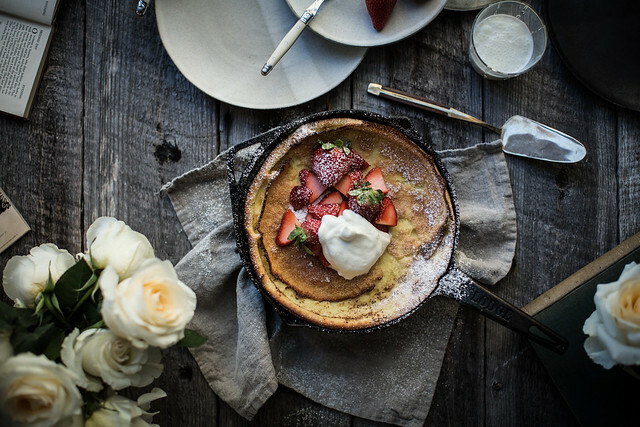 Also.. I’m always looking for good recipes for Dutch Baby pancakes and new toppings, and this sounds delicious! I’ll definitely have to try. Ah, yes, congratulations on the baby, you’re in for the ride of your life, and the biggest love everrrrrrr!!! So happy for you! 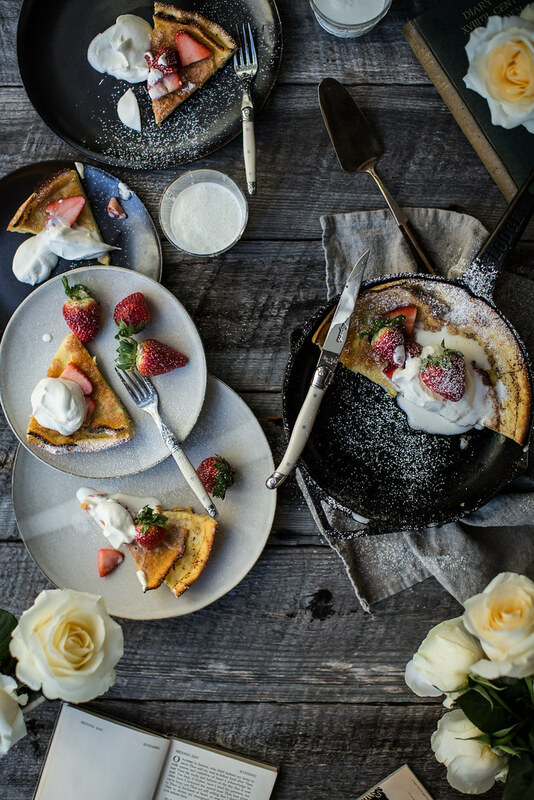 I must try these pancakes, they look quite delicious and dutch babies have been on my to do list for over a year!!! Your honesty and vulnerability are so beautiful, as is your depiction. I wish I could see mine that way too!! You are so brave. Your photos are so beautiful. I love the details and the layers and the gorgeous food. I want to have your styling eye. So inspiring!!! 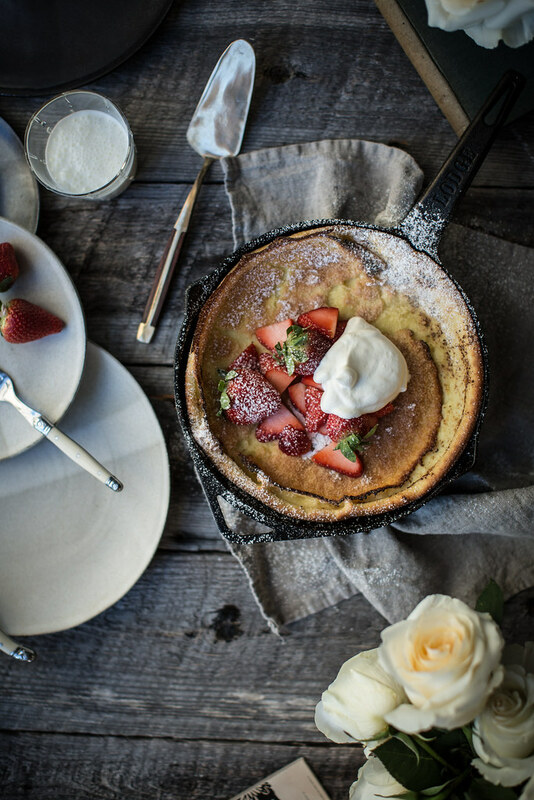 This dutch baby is love at first sight. 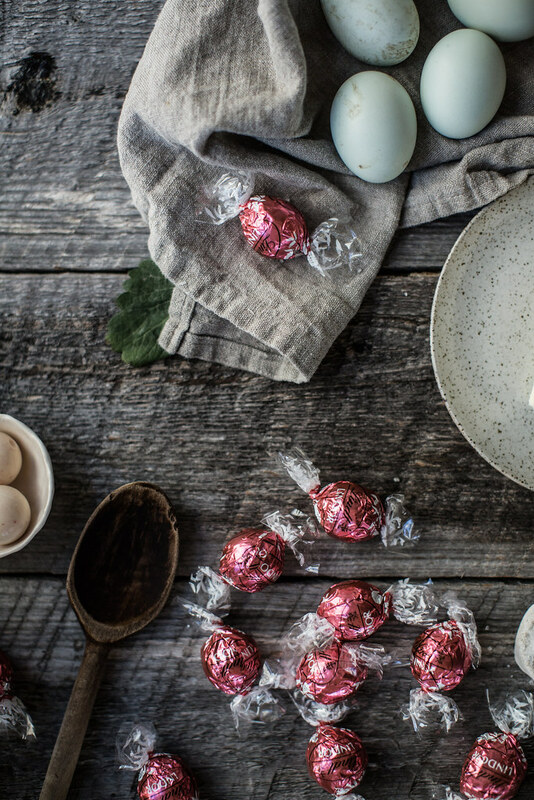 Gorgeous – and the white chocolate just perfected it. 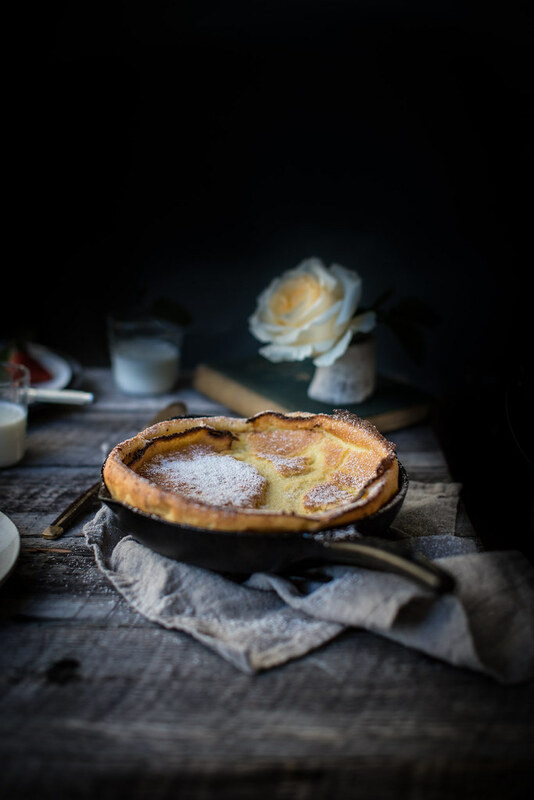 Love the dutch baby – and the coy ending to your post. Beautiful. As a fellow happily married woman, Valentine’s day for me is all about the small, deeply satisfying ways that we show each other our love. I made dinner, because that’s how I express love. He lit candles and played music, because that is how he shows love. It’s nothing earth moving, or monetized. It’s almost boring. It’s perfect. These dutch babies look beautiful. If I hadn’t had to work brunch on Valentine’s Day I would have made these. Also, babies? Congratulations! On the issue of getting those eggs really really whipped – for times you might want to accomplish that but his man arms aren’t available (holding a baby, as one example) I know you like found items from the past. They used to make egg beaters with metal gears – not those flimsy nylon things like they put in the new ones. An old egg beater with metal gears is a thing worth having and so satisfying to use. Watch those rummage sales and flea markets. That’s where both of mine came from. They usually have wooden handles, too, which is an added aesthetic bonus. And if you plunk the beater end into a bowl of water as soon as you finish whipping they will wash up easy as can be even if you don’t get to it right away. I always love reading your blog and your lovely stories. I feel the same way with my husband- it is just lovely being together no matter what we are doing. I have never made dutch babies but you have inspired me to try. Beth! Help! I was lucky enough to be gifted a whole basket of bergamotte the other day, and cut up a few to make marmalade. I have never even seen bergamotte before, and they are lovely. Kind of fresh and bright and happy on the outside, and more complex and sinful on the inside. I mean, one can relate. What should I make of them? Bake something? Any ideas? how lovely! I was wondering– you snapchatted some sinfully delicious looking dish with a comment that it was chock full of cream, and while I shouldn’t ask for the benefit of my ever-expanding waist line, I was wondering if you had any plans of posting the recipe? It looked so comforting for the final throws of winter here in the Northeast. Finally, congratulations on the coming addition to your family, so happy for you both! Stunning photos. They look peaceful and quiet. Wish I can be there too. I’m so lucky to see this post. Good job! My firs time visiting your blog, really beautiful images. wow, I’ve only just read this post properly, I knew in my fuzzy memory you had a dutch baby recipe so I’ve just searched it and found this. I love the recipe and the story! I have recently made my first ever (chocolate) dutch baby and I cannot understand how on earth I haven’t tried it before! We loved it! Thank you for sharing your emotions. Not every one is brave to expose that way. You are great. God bless ! Oh, yes, there is so much we have to learn from you. Enjoy every moment. It looks absolutely amazing. All of your photography really beautiful. I just made this, and WOW. I could have eaten the whole baby.